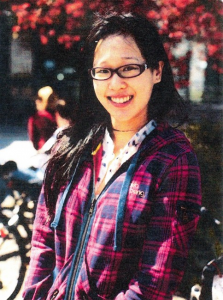 Canadian Woman Missing in L.A.
You are at:Home»English»Community News»Canadian Woman Missing in L.A.
Elisa Lam, 21, of Vancouver, British Columbia, was traveling alone. She was last seen Thursday at the Cecil Hotel, 640 S. Main St., LAPD Lt. Walter Teague of the Robbery-Homicide Division said. “She had been in contact with her parents daily until (Jan.) 31st,” Teague said at a news conference at police headquarters, accompanied by the missing woman’s family. Lam was last seen by staff at the hotel. Teague said LAPD detectives were contacted by Canadian authorities, and began investigating the woman’s disappearance Tuesday. Teague declined to elaborate about why police felt the woman’s disappearance suggested foul play, other than to say it was “very unlike her” not to remain in contact with her family. Lam arrived in Los Angeles on Jan. 26, and her final destination apparently was Santa Cruz, Teague said. She was traveling alone. Lam is of Chinese descent, 5 feet 4 inches tall, weighs about 115 pounds, and has black hair and brown eyes. She is fluent in English and also speaks Cantonese. She has used public transportation such as Amtrak trains and municipal buses. Anyone with more information on the case was urged to call detectives Tennelle or Stearns at (213) 486-6890, or (877) LAPD-247.